August 25 - St. Joseph Calasanctius - Optional Memorial - My Catholic Life! The star of today’s saint burns less brightly than others in the great constellation of counter-reformation saints. But the educational vision of Saint Joseph Calasanz, and the ultimate spread and triumph of his order after his death, have had an enduring impact far exceeding his humble reputation. Calasanz was born into a minor noble family in Spain, the youngest of eight children. His parents valued education and sent their boy to religious schools to receive a fine training in the classics. While a teenager, he decided that God was calling him to be a priest. After finishing his university studies with distinction, he was ordained in 1583. He carried out several sensitive and important pastoral and administrative duties for his local bishop and then made a life altering decision. In 1592 he resigned his appointments, gave away his inheritance to his sisters, funded some worthy projects for the needy, and departed for Rome. He would live there for the next fifty-six years of his long life. Like his Roman contemporary Saint Philip Neri, Joseph saw the pressing need to educate the great mass of poor children who spent their days doing everything except going to school. With the assistance of highly placed connections in the Church and Roman nobility, Joseph was given rent-free space in a parish where he offered free classes to poor children. The only schools in existence at the time were tuition based. Without knowing it, Joseph had done something revolutionary. He had started the first free school in modern Europe, although similar initiatives were quick to follow. Joseph’s free school for the poor immediately exploded in size to over a thousand students. He and his co-workers quickly founded similar schools in other regions of Italy, became more disciplined in their approach, and sought, and received, official status in the church. In 1622 the Pope approved the Order of Poor Clerks Regular of the Mother of God of the Pious Schools, or the Piarists, as they were commonly known. They were the first order of priests dedicated to primary school education. While his successful educational vision was being implemented, Joseph’s work provoked envy among the upper classes, clerics included, who resented educating, for free, the lower echelon of society. Joseph also aroused suspicion for his personal friendship with Galileo Galilei, who was under investigation by Church authorities for his theory that the earth moved around the sun. Crises internal to the Piarists concerning the sin that dare not speak its name caused even greater alarm. All of these pressures and intrigues led to Joseph’s arrest and humiliation by the Inquisition for a brief period in 1642. Two of his own Piarist priests were his most bitter enemies, and in their attempts to cover up their own sins and incompetence they pulled every lever of influence they could put their hands on to remove Joseph as the head of his own order. Joseph was not bitter, said it was the Lord’s will, and forgave them. Due to its internal problems, however, the order was suppressed in 1646. When Joseph died in 1648, aged ninety, his life-work had been obliterated. But the Piarists were resurrected in the following decades, thrived, and opened schools in various countries. Piarist fathers helped stem the Protestant tide in Poland, educated luminaries such as Mozart, Haydn, Schubert, and Goya, and provided the model for free public schools later adopted by Saint Jean-Baptist de La Salle and Saint John Bosco. Joseph Calasanz was canonized in 1767, “a perpetual miracle of fortitude and another Job,” in the words of a Pope. 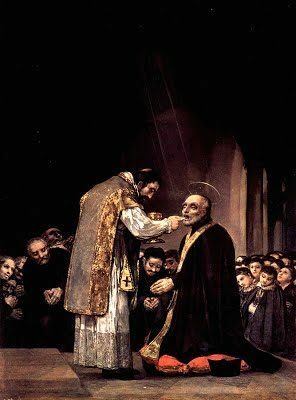 Saint Joseph Calasanz, you were disgraced, defamed, maligned and imprisoned and yet forgave all who had robbed you of your most precious personal possession, your reputation. Help us to be so forgiving toward those who steal from us what we have taken so long to build up.